Best Quotes Reviews - Is it a Scam or Legit? Despite the Best Quotes URL having been registered since 1998, the company is not listed with the Better Business Bureau. In addition, legitimate online reviews regarding Best Quotes appear to be fairly rare, which could be the result of two things: 1) Best Quotes doesn’t actually provide you with quotes (more about this in the last section). Instead, they sell your information to a local insurance agency, who then contacts you. This means that if you’re dissatisfied with the process, it’s likely you’re going to leave a negative review about the agency, not Best Quotes. 2) Best Quotes has a fairly extensive affiliate program, which means that many online “reviews” are actually just thinly veiled sales funnels. 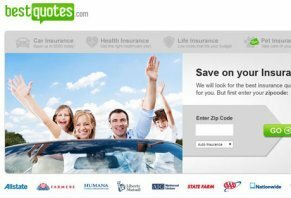 Owned and operated by ReviMedia, Inc., Best Quotes is a website that claims to help you find the best quote on numerous types of personal lines insurance, including business, car, health, and life. Regardless of your credit or claim history, the company claims that it can help you save up to $500 on your next insurance purchase. Choose the type of insurance you’re looking for, and enter your zip code. Fill in some additional information, and you’ll be matched with insurance agents in your area. Receive offers, and choose the rate/coverage combination that meets your needs. During the process, you’ll be required to enter personal information such as your name, address, gender, and date of birth. Depending on the type of policy you’re looking to purchase, you’ll also need to enter additional information such as vehicle year, property information, health data, and so forth. Once this portion is complete, press the “Get My Quotes” button, and you’ll soon be contacted by up to eight independent insurance agencies regarding your quote. The Best Quotes service is completely free of charge. Bottom Line: Is Best Quotes a Scam? If you were to just briefly read through the Best Quotes website, you could easily be lead to believe that your information will be reviewed by a company employee, who then obtain the best insurance quote possible. However, this is not the case. Best Quotes is owned and operated by ReviMedia, Inc., which is a very large lead generation company. In other words, ReviMedia specializes in obtaining information from customers, and then selling this information to companies who can potentially sell their services. This means that, in the instance of Best Quotes, they’re selling your information to an independent agency, who will represent at least some of the insurance companies listed on the Best Quotes site. In other words, you’ll actually be contacted by an agency representative—not a Best Quotes employee. When it comes down to it though, Best Quotes can make the insurance quoting process much less labor intensive. You’ll just have to complete one simple form, and you won’t be required to call around to multiple agencies for one single quote. However, keep in mind that there doesn’t appear to be any kind of quality control process in place for the agencies that Best Quotes sends your information to. Because of this, be sure to read online reviews about any agencies that contact you before purchasing a policy from them. Write a Review for Best Quotes!